I've got the answer to your next rainy day activity: ClimbZone. Yes, it's located in Laurel, Maryland, which means it's 30~45 minutes away from the District. And yes, it's not cheap, at $25/person. But oh my, is it amazing fun. 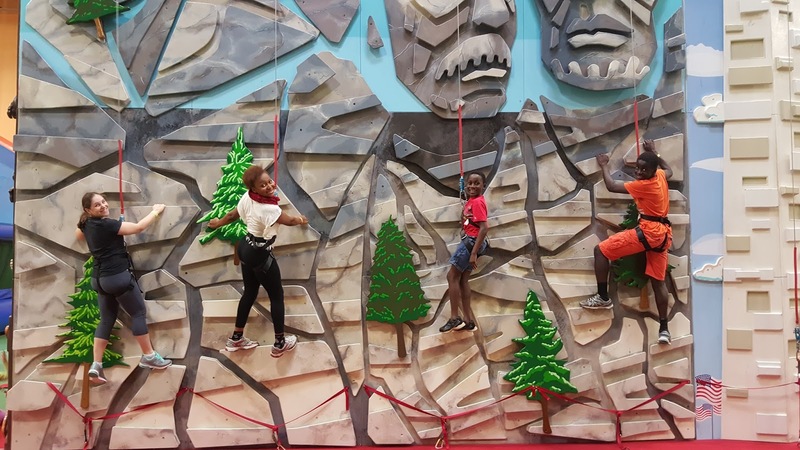 ClimbZone is a warehouse size building filled with different themed climbing walls. At each wall is an auto-belaying rope. You clip your harness in, unclip the belaying rope, and off you go. When you're ready to go down, you simply let go and the belay rope gently lowers you to the ground. That's about all there is to it. The rest is just pure fun. We hit ClimbZone this last Sunday, and even though it was busy, nobody had to wait for any walls. There was always something to climb. Shira and our friend's 3 kids did the climbing. I did the photographing and cheering (more on that below, and no, I didn't have to pay to get in). Apparently, anyone older than 2 years old can climb. And they had many small kids playing on the walls like it was nothing. 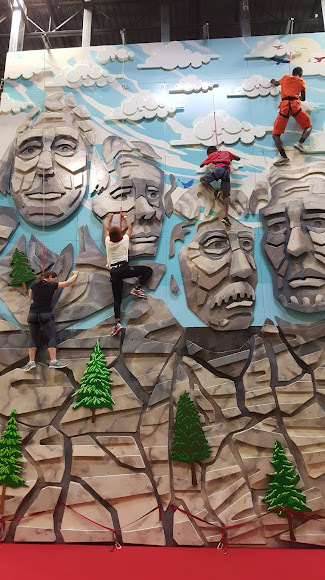 There were also adults climbing. Along with the climbing walls, there were a couple of moon-bouce like structures for younger kids to play on. I decided to opt out of this adventure. My fear of heights would have very quickly kicked in, leaving me more stressed out than anything else. Though, part of me does see an opportunity for a little heights coping therapy here. $25 is going to be far cheaper than a therapists appointment, right? So I'm thinking I should hit the gym with Shira, pay my $25 and just push my fear of heights ever so slightly. Sure, I'll look downright foolish next to the kids who effortlessly scale the walls, but it seems like a safe place to incrementally tackle one of my phobias. Or maybe not. All I know is, the kids had fun, got a great workout, got to work on their problem solving skills. That's a winner in my book!